Mile 1 – Slow down, slow down, slow down! How comes everyone else is so much faster than me? Am I at the back of the race? Mile 2 – Ok this pace feels ok, now it is time to find someone to talk too. It’s still such a long way and it would be so much easier if I was chatting away with someone. Mile 3 – Yes I’ve found some people, but they don’t really want to be going the same pace as me. Crack a joke, then the group in front my start talking to us too. Mile 4 – Yay, these people want to talk, too! Let’s all talk about marathons. Did I tell them I have run two marathons before? Ooo look there is a camera man, I wonder if I’ll get a flying feet picture this year? Shall I smile, or pretend I don’t know they are there? Mile 6 – Oh yes, here we are, this is the turn off. *Reads sign, “20 milers only turn here on first lap!” Just think we will be here in about 2+ hours, and the run will all most be over. Mile 7 – This is the quite area of the run, pretty streets, big houses, nice neighbourhood. Mmmm what I am I thinking? Remember you are going to write that blog post about what you are thinking, so what are you thinking? I don’t think I think about much to be honest! Mile 8 – This is like déjà vu, we ran this section just a little while ago, and I’ll be running it again in and hour and a half! Is that a niggle I can feel? Mile 10 – Half way – have I really got to run that distance again? Can I do it? How do I feel? Is that my knee hurting? Have a drunk enough? It’s really warm today. Mile 11 – I can’t wait to be running down this stretch of road again, i’ll be nearly finished then! Mile 12 – *Passing the finish line – Why do I run these long distances? It would be lovely to be finishing now. I could just stand and cheer everyone else on! Mile 13 – So i’m just coming up to completing a half marathon, which is awesome, but I still have so far left to go. I must remember to take some pictures, blog posts are always so much nicer with pictures? Mile 14 – How do people manage to run and take good pictures? I’m not stopping to take pictures! Oh well, I’ll just click away and see what comes out? Mile 15 – This seems a particularly long mile. Have they moved Hampton Court Bridge, as I am sure that it is supposed to be here somewhere. 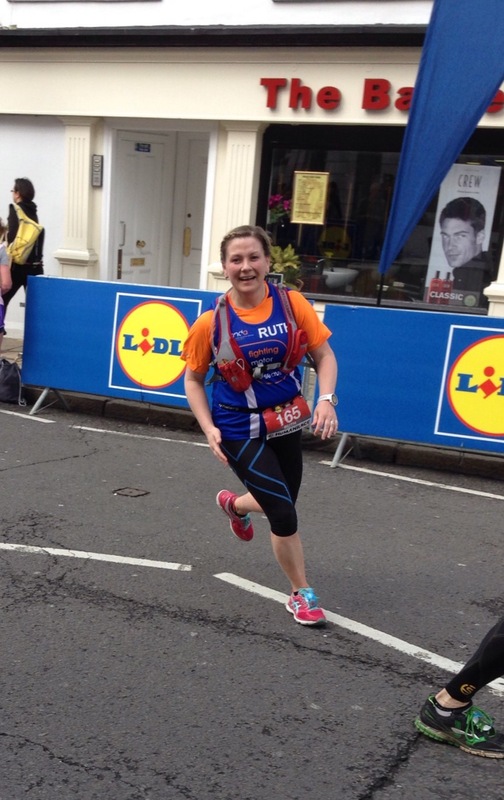 Mile 16 – Someone mentioned bacon sandwiches – I would LOVE one of them now! Actually I am quite hungry, what will I eat when I’m finished? Did I bring the remains of the Easter egg with me? 4 miles to go, this is where I met my friend Tina when I did my last 20 miler. We enjoyed that last 4 miles. I can do this. Mile 18 – So we did picked up the pace, and it is hurting more now. Just think, in a marathon I’ll still have over an hour more to run. Why do I think running marathons is a good idea? I should stick to half marathons. This is hard. Mile 19 – I just want to stop. Can I stop? What if I walked a little bit? I am so close, but I just want to be finished. I am so pleased that we paced this so well, we are now passing all the people that flew off at the start. No one will pass us, they are all fading. * Girl passes us at speed. She surely must be in the 8 or 16 mile event! Mile 20 – this is the longest mile EVER. Do I have it in me to put a little sprint in at the end? I’ll keep pushing, but this is hard. Next year I want to do the 8 miles. Can I see my husband and daughter? Ahh look at the children on the left giving out high fives. I’ll go over to the left and high five them. *Shout from husband. That is typical, he is on the right side and my daughter has her hand out too for high fives. She has a grumpy face as I didn’t high five her! Quick U turn. Ok, lets get this over and done with. Legs, can you sprint? Oh ok, probably not, but we will get a little faster. Thank goodness that is all over! Is a marathon really another 6 miles on top of that? Oh fun! And thank you Ruth for sharing your story with us.